Citrulline malate is a compound which is made by combining citrulline and malate salt or malic acid. Citrulline malate is also known by names like citrulline and citrulline ethyl ester. Various citrulline benefits can be experienced by those who consume citrulline malate in the recommended amount. The most important reason why citrulline malate is mostly popular is the stamina and elated energy levels that it provides for athletes and bodybuilders. It prepares their body to fight with muscle fatigue and boots the performance by enhancing muscle mass and quick recovery level. It is the reason why citrulline malate is often consumed and recommended by people who indulge in weight training and other such intense exercise routines. Citrulline malate side effects are observed in case of its overdose. Citrulline malate removes body toxins and endotoxins like ammonia, lactic acid saturations. All these things affect performance and energy level of a person. Citrulline is a non-essential amino acid (meaning it cannot be produced by the body) and plays a role in nitrogen balance and metabolic processes. Citrulline is found in the rinds of watermelons and research is currently being conducted to grow watermelons with higher levels of citrulline in the center of the melons due the significant health benefits of citrulline. Supplemental citrulline malate is a salt form of the amino acid. The malate, or malic acid, is found in fruits such as apples and enhances the effects of citrulline. Malic acid takes part in aerobic cellular respiration where oxygen and a carbon compound (acetyl Co-A) are used to produce immediate energy and CO2 in the mitochondria of the cell. This is called the Kreb’s cycle. Malate conditions the recycling of lactate and pyruvate promoting efficient energy production and protecting muscles from fatigue. Citrulline bypasses uptake in the liver and is circulated for distribution to the kidneys, brain, muscle and other tissues for conversion to arginine. You won’t notice any health problems like cramping, bloating or water retention after hard training. It plays an important role in the production of arginine, which stimulates the secretion of human growth hormone and prolactin, helps in bodybuilding, enhances blood flow and relieves stress. L-citrulline and l-arginine promote heart health, strengthens the immune system and offers energy. L-citrulline benefits include improved blood flow, improvement in sexual function in both men and women, providing physical and mental relief, reducing stress, improving body metabolism, improving communication between nerve cells and other parts of the body, etc. L-citrulline is also used for Alzheimer’s disease, dementia, sickle cell disease, high blood pressure (it is used to control high blood pressure in children after heart surgery), and diabetes. Citrulline malate is a salt form of citrulline. Citrulline malate supplements are available in market and are recommended to athletes. Citrulline malate benefits include, improvement in aerobic performance and capacity as it influences lactic acid metabolism and prevents muscle from fatigue. Citrulline malate helps reduce blood acidity and also protects against ammonia poisoning, as it accelerates the removal of ammonia. The recommended dose of citrulline malate is three to four grams twice daily. While some state that citrulline malate is absolutely safe to consume regularly, some people claim that it has a few potential side effects. The reason why many of the people do not observe citrulline malate side effects of any sorts is because this compound gets easily digested and is also well tolerated by body system of most of the people. It is the reason why people who experience side effects of citrulline malate are really less. 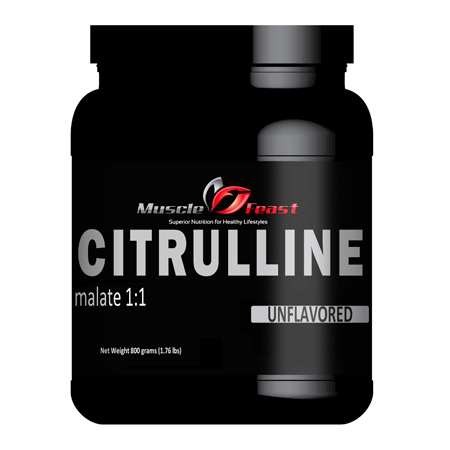 About 15% of the citrulline malate users have complained about mild side effects. All these side effects are related with stomach problems and digestive health. People with heart diseases, high cholesterol levels, other cardiovascular diseases and breastfeeding women should also consult their health care provider prior to consumption of citrulline malate. This product will retain a 2 year shelf life from the date of manufacturer if properly sealed and stored in a dry, cool environment outside of direct sunlight. How can Muscle Feast quality be so high yet prices so low? We are able to keep our pricing so low because we are a relatively small manufacturer with very low overhead and we sell direct to the public. We source the same great suppliers used by more popular brands. Notes: Citrulline malate has a sour taste and may be clumpy.